Philadelphia Press - National Police Gazette : Sandwich Island Girl, 1888. This page was instigated by “Skipper” Funderburg in July 2010, with ongoing contributions to 2018. Many thanks to Skipper for his diligent research, his notes are reproduced below. In Search of a Sandwich Island Girl. 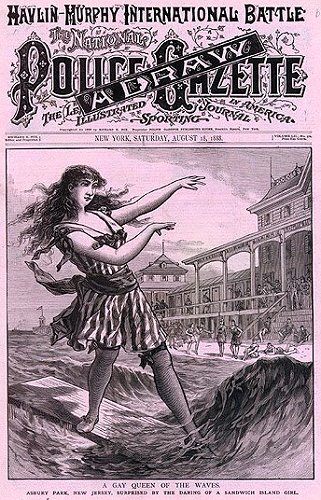 On 2nd August 1888, the Chicago Tribune reprinted an unsigned letter headed A Gay Queen Of The Waves, purporting to record the recent appearance of a Sandwich Island Girl riding a surfboard in the waves of Asbury Park, New Jersey. Accredited to The Press of Philadelphia, located over 60 miles from the Atlantic coast, the letter was presumably published in late July, at least several days before appearing in Chicago. The original publication in Philadelphia has yet to be located; a copy of which may, but probably would not, reveal the author. Following it's appearance in Chicago the letter was reprinted in St Louis, Nashville, and Omaha, and accredited to Philadelphia's Press. Most dramatically, the letter was reprinted several weeks later, without any accreditation, in New York's infamous National Police Gazette along with a full page illustration on the cover. A confusing confection, derived from surfing images widely published since 1819, it was likely to have been prepared in-house by one of the Gazette's illustrators. The beach scene afforded the artist an opportunity, within bounds, to expose their subject's feminine charms; this was hardly unprecedented as risqué images of women regularly featured on the cover of the Gazette, see below. Unsigned correspondence, then as now, invariably invites scepticism. Richly infused with flamboyant description, rather than the work of an enthusiastic Asbury Park local the style suggests a hand with experience, able to tell a colourful tale while scrupulously avoiding any hard facts. Beginning with James Cook's mariners, there were numerous published accounts of surf-board riding by visitors to the Hawaiian Islands and in the later 19th century it was not unusual for travel and fiction writers to incorporate surf-riding in their work, without actually visiting the Pacific; for example R.M. Ballantyne's The Coral Island (1855). None of the persons, the Sandwich Island Girl, her enormously rich planter father, her companions (the family of a wealthy New York importer) or the fashionable hotel at Asbury Park, are identified by name. Whereas Skipper Funderburg has suggested that news reporting was much different then, (the) papers were less interested in getting names of participants or attributing names to quotes, this is not my experience; around the turn of the 19th century, journalists writing for reputable newspapers seem to have gone to considerable effort to accurately detail names and locations in their reports. The Sandwich Island Girl letter was seen, and was of particular interest, to Mr. J.L. Graham of Sea Bright, New Jersey. Not only was Graham living just ten miles up the coast from Asbury Park, he was long-time resident of the Hawaiian Islands, had married into a respected Honolulu family, and he had undoubtedly observed surf-riding. With his Island connections, Mr. Graham could have perhaps expected some notification, or gossip, of such a distinguished visitor from home to the Atlantic Coast. Nevertheless, ostensibly to enquire about the Sandwich Island Girl's whereabouts, he called at the office of the Daily Press (later the Asbury Park Press) on the 2nd August, 1888, a couple of days after the Sandwich Island Girl letter was (probably) published in Philadelphia. Interestingly, Graham claimed that he knew the young lady and desired to find her. While it is highly unlikely, the original Philadelphia account may have additional information edited from the later reprints, or perhaps Mr. Graham was merely ensuring that his intentions appeared honourable. However, given a suspicious lack of detail, Graham may have been testing the letter's veracity. Relocating to Sea Bright from Honolulu in early 1886, from early 1888 he was a partner in E. Gogorza & Co., Commission Merchants of New York City, and thus he was likely to be aware of many wealthy New York importers, perhaps even those who's family was said to be hosting the visiting surf-rider. Furthermore, his business and family connections in Honolulu made it probable that he would know of the Sandwich Island Girl's enormously rich planter father, if not all the members of his extended family. And, given account of several days of surf-riding, before a significant number of spectators, and the high status of the visitors to Asbury Park, he (and we) could have reasonably assumed that the story would be the talk of Asbury Park and familiar to the local press; even if they may not have published, or been responsible for, the letter to Philadelphia. It appears that the staff of the Daily Press had no knowledge of the Sandwich Island Girl's activities, aquatic or otherwise. Accordingly he placed an advertisement asking for her whereabouts, which was published on 6 August with the reply address as J.L. Graham, Sea Bright, N.J. Although the report of Graham's visit to their office in the Daily Press was headed Will the Search be Successful?, the question remains unanswered. 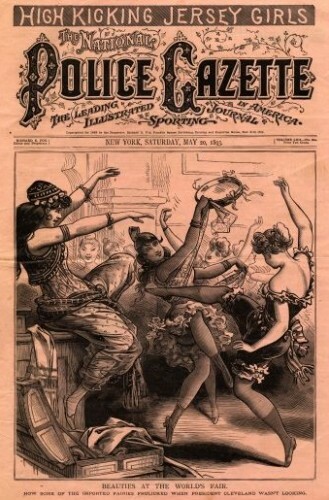 Originally printed late July, 1888. Reprinted on 2, 4, 5, 13, 18 August, 1888. Ashbury Park, New Jersey, surprised by the daring of a Sandwich Island girl. A group of summer loungers on the beach at Asbury Park, N.J., were watching the extraordinary antics of a dark eyed, bronze-faced girl in the sea a few mornings ago. The object of all this interest and solicitude was beyond the line of breakers and standing on a plank that rose and fell with the swelling waves. Her bathing dress was of some dark material, fitting close to the figure, the skirts reaching scarce to her knee. Her stockings were of amber hue, adorned with what from the shore seemed to be vines and roses in colored embroidery. She wore no hat or cap. Her hair, bound across the forehead and above the ears by a silver fillet, tumbled down upon her shoulders or streamed out upon the wind in black and shining profusion. Her tunic was quite sleeveless, and one could scarcely fail to observe the perfect development and grace of her arms. As a wave larger than those which had gone before slowly lifted the plank upon its swelling surface, she poised herself daintily upon the support, her round arms stretched out and her body swaying to and fro in harmony with the motion of the waters. As the wave reached its fullest volume she suddenly, quick as thought, and with a laugh that rang full into shore, drew herself together, sprang into the air, and, her hands clasped together and clearing her a way, plunged into the rolling sea. There was a little cry from timid feminine watchers on the sand, but the smiling face was above water again while they cried, and the daring Triton was up on the plank again in another moment and waiting for a second high roller. So she has been amusing herself and interesting the mob for three mornings. She is as completely at ease in the sea as you or I on land, and the broad plank obeys her slightest touch. When she has had enough of it she will bring the plank into shore, she riding upon the further and gliding it like a goddess over the crests and through the foam of the biggest breakers. She comes from the Sandwich Islands and is making a tour of the country. Her father is an enormously rich planter. She arrived in the Park a week ago with the family of a wealthy New York importer. She is at a fashionable hotel and is one of the most charming dancers at the hotel hops, as well as the most daring swimmer on the Jersey coast. She is well educated and accomplished, and, of course, speaks English perfectly and with a swell British accent that is the despair of the dudes. She learned to be the mistress of the waves in her childhood at her native home by the sea, where she modestly says, all girls learn swimming as a matter of course, quite as much as girls in this country learn tennis or croquet. Omaha Daily Bee, August 13, 1888, page 8. - Philadelphia Press Letter. Asbury Park, 3 August, 1888. Will the Search be Successful? Yesterday a gentleman called at the Daily Press office and said he had seen in one of the New York papers a personal notice of the arrival in Ashbury Park of a young girl from the Sandwich Islands. His home was located there- he knew the young lady and desired to find her, and accordingly placed an advertisement in this paper asking for her whereabouts. Note: The Daily Press was the predecessor to the Asbury Park Press. Asbury Park, 6 August, 1888. The undersigned desires to know the whereabouts of a young lady from the Sandwich Islands who is stopping in the Park. Address: J.L. Graham, Sea Bright, N.J.
August 18, 1888, page 1. 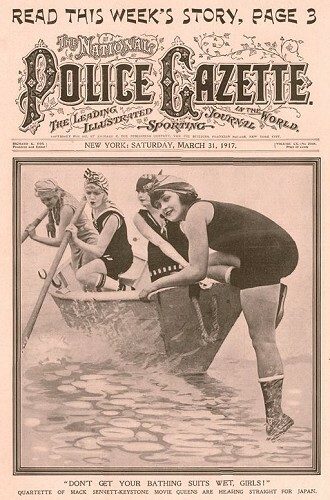 The National Police Gazette was the forerunner of the men's lifestyle magazine, the illustrated sports weekly, the girlie/pin-up magazine, the celebrity gossip column, Guinness World Records-style competitions, and modern tabloid/sensational journalism. 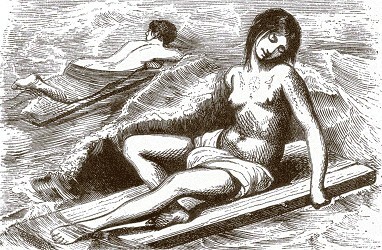 A confusing confection, derived from surfing images widely published since 1819, the illustration was likely to have been prepared in-house by one of the Gazette's illustrators. The beach scene afforded the artist an opportunity to, within bounds, expose their subject's feminine charms; this was hardly unprecedented as risqué images of women regularly featured on the cover of the Gazette, see below. Jacques Arago: Wahine, Hawaii, circa 1819. Wallis McKay: Surf-swimmers, circa 1874. The header was created by Henry W. Troy, his signature appearing in every issue. Matt Morgan, Charles Kendrick, Philip G. Cusacha, George G. White and George E. McEvoy. Don't Get your Bathing Suits Wet, Girls! Ellen's father, John H. Coney was appointed Collector of Customs for the Port and District of Hilo in 1861. 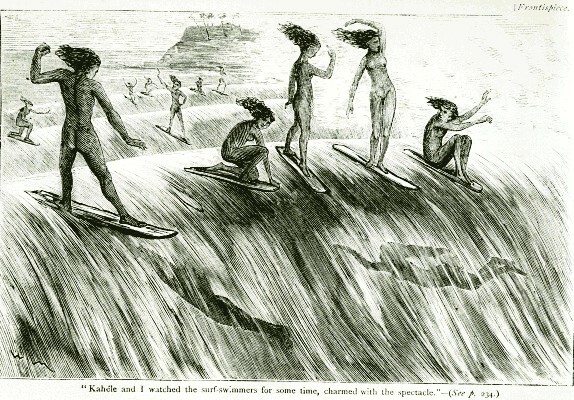 Hilo Bay was a major centre for surfboard riding, said to rival Waikiki, and there are numerous accounts written 19th century, that of Charles Nordhoff published in 1873 featuring an early illustration. He was active in business and following his death in 1880, Mrs. Coney and her family were well known in respectable society. Notably in 1882, Mrs. Coney and one of her daughters were among the guests at a Royal luau at the King's residence Pualeilani at Waikiki. After dancing (the quadrille, the waltz, and the lancers) the guests sat in the traditional manner for a sumptuous luau. Remarkably, when the party returned to the dance floor, their cab-drivers and staff were pressed with royal cordial hospitality to partake of the superabundant bounties that remained. There were three daughters, "S." (later Mrs. S. J. Levey), Lizzie and Ellen. On a world tour with her sisters in 1885, Miss Ellen ... who is exceptionally handsome (with) pretty shoulders and beautiful eyes, when interviewed by the press in California commented that: "To me there is no place on earth like the Hawaiian Kingdom, where the enjoyment of lawn tennis and dancing is always obtainable." Regrettably, but perhaps understandably, the interviewer did not venture to ask Miss Ellen about Waikiki. J.L.Graham and Ellen Coney wed at the Coney family home in December 1885. Departing as Kamamas (? ), they relocated to New Jersey from Honolulu in early 1886, and Mr. Graham was made a partner in an import agency in New York City in 1888. Note that although the newspaper's official title was The Press, in 1888 it would have generally be known by its former name, The Philadelphia Press (1880-1885). Chicago Tribune, 2 August 1888, page 9. - Philadelphia Press Letter. St Louis Post Despatch, 4 August 1888, page 7. - From the Philadelphia Press Letter. National Police Gazette, August 18, 1888, unaccredited Letter on page 14, with front page illustration. I first heard of Kaikilani Coney Vos in 1991, when I saw a painting of her in the small Kaua'i Historical Society museum on the grounds of the Coco Palms Hotel. Hawaiian Journal of History, Volume 38, 2004. Requires eVols or UH Web Login Service. 5. Asbury Park chronicle. (Asbury Park, N.J.) 1873-???? 6. The artesian. (Asbury Park, N.J.) 1882-???? Honolulu, March 2, 1861, page 3. With the approbation of His Exellency the Minister of Finance, the Collector General of Custom has appointed JOHN H. CONEY, Esq., to be Collector of Customs for the Port and District of Hilo, in place of B. Pitman, Esq., resigned. Honolulu, January 17, 1877, page 4. JOHN H. CONEY vs. JAS. A. D0WSETT. Opinion of A. Francis Judd. This is a action in which $10,000 are claimed as damages for the trespass of the defendant's cattle upon the land " Honnnlinli." in Ewa, Oahu, the properly of the plaintiff, since Oct. 16th. 1875. The jury returned a verdict for the plaintiff of $200. and a motion is made to set aside this verdict and grant it new trial, on the ground that the jury must have mistaken or disregarded the instructions of the court on the effect of certain leases under which the defendant justified, or that the jury misunderstood the evidence. Honolulu, April 21, 1880, page 3. Last Saturday Mr. Coney's fine residence on the corner of Palace Walk and Richards' street, had a narrow escape from fire. Ignition had taken place and was discovered only in time to prevent a serious fire. The flue was full of soot, which took fire, a not uncommon occurrence in other countries. Too much care cannot be taken in guarding against fire. Honolulu, October 23, 1880, page 2. Supreme Court of the Hawaiian Islands. In Probate. Island of Oahu, Hawaiian Islands. ss. In the matter of the estate of JOHN H. CONEY, late of Honolulu, In the Island of Oahu, deceased. Order appointing time for Probate of will and directing publication of the same. Honolulu, May 27, 1882, page 3. There were three runaways on Monday. Mrs. Coney and her daughter Mrs. Levy were driving up Beretania street when the horse bolted. The buggy was over-turned at the corner of Punchbowl street and both ladies thrown out. Mrs. Coney suffered a dislocation of the shoulder. Mrs. Levy fortunately escaped with a few bruises. Mr. J. O. Hayselden left his horse and buggy' standing at Messrs. E. O. Hall & Son's corner, and the horse being frightened by a bullock team passing, turned round and in doing so upset the buggy, which he immediately proceeded to kick to pieces. The third accident was to an express. The horse ran away and capsized and smashed the carriage at the corner of Richard and Beretania streets no one hurt. Honolulu, October 7, 1882, page 5. The King entertained on Saturday a party of about one hundred guests at a luau, at his residence Pualeilani, Waikiki. This place is now become one of the most delightful retreats in the suburbs of the city. The ancient ancestral cocoa palms at this time tower above umbrageous groves of the algeroba, and beneath the light feathery spray of these groves, the Bermuda grass has covered the ground with close turf of thickly intermatted herbage so that guests ramble over broad, green, close sodded, lawns beneath an inviting shade of beautiful foliage. A dancing floor was laid upon a shaded retreat in the lawn, and overhead was spread a royal Hawaiian standard and a broad ensign of the American stars and stripes. When the main portion of the guests had assembled, about 2 p.m., His Majesty and Mrs. Wodehouse, Minister Daggett and the Princess Liliuokalani, and Premier Gibson and Mrs. Hendry led the way to the dancing floor, and here the assembled company enlivened by the sweet strains of a cotillion band disported themselves in the quadrille, the waltz, and the lancers. After a few sets, the gay party, led again by His Majesty and Mrs. Wodehouse, adjourned to the luau pavilion. Here a choice collation was arranged on a long, low platform in horse shoe form, and only raised about six inches from the ground and beside which the hundred guests sat on mats in the recumbent, or cross-legged fashion which the ancient Europeans must have observed ere the invention of chairs for dining tables. On this occasion some long limbed guests found it difficult to dispose of the superfluous portion of their extremities, some knees being elevated above the platform, and some feet were scattered about in promiscuous directions. However, with abundant courtesy, good humor, and jocularity the guests adjusted themselves and partook heartily of the Hawaiian luau or cold lunch, in which poi and fish (choice pond mullet in ki leaves) ohu, chicken salad, roast pig, soft crabs and other appetizers abounded. After a bounteous repast which was associated with much conversational humor, quip and bon mot,; in which Minister Daggett takes a lively part, the company returned to the dancing floor. On this occasion another company not formally invited, but at the same time being there were pressed with royal cordial hospitality to partake of the superabundant bounties that remained. This company was composed of the numerous cabbies or expressmen assembled, and other followers of the occasion. These outside guests toasted the King and his Ministers, and otherwise expressed their satisfaction at the courteous and hospitable treatment accorded at a royal luau to those who usually have to wait outside with empty stomachs on such occasions. The dance went on joyously till a late hour in the afternoon, and not until the sun's low slanting rays began to throw the whole grounds into shade did the company begin to disperse. And they went away, we feel assured, full of kindly and grateful feeling towards a gentlemanly royal host who seeks with a generous heart to make all who come to partake of his hospitality enjoy themselves and feel at home. Honolulu, February 3, 1883, page 2. On Saturday, at noon His Majesty the King received the Envoy Extraordinary and Minister Plenipotentiary of Japan to Hawaii at Iolani Palace. The Embassy, accompanied by Colonel Curtis P. Iankea, next proceeded to the residence of Her Royal Highness Princess Likelike at Waikiki. The Princess accompanied by the Hon. A. S. Cleghorn, Princess Kaiulani and her Governess, Miss Barnes, Miss S. Coney, Miss L. Coney and Miss A. Cleghorn received the Minister and his suite. 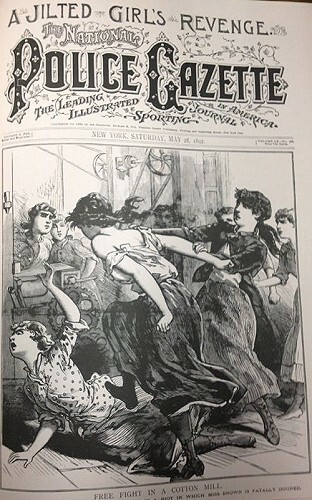 Honolulu, June 26, 1885, page 4.
and Ellen Coney, who are the daughters of the late John H. Coney, at one time a well known capitalist of New York. Mr. Coney, who died four years ago, was wedded in early days to Miss Ena, a beautiful Hawaiian maiden. His eldest daughter became the bride of S. J. Levey, a Honolulu merchant. Since July, 1884, the party referred to has been traveling over the globe in company with Hon. and Mrs. Samuel Parker, who returned to Honolulu on the 15th of last month. T. V. H. Robertson also accompanied them. Mrs. Levey intended returning to Honolulu several weeks ago, but was detained here by the illness of her infant child. Mr. Levey departs for home to-day upon the steamer Alameda. Her sisters will follow on the 1st proximo. In conversation with Miss Ellen Coney one evening last week, the lady, who is exceptionally handsome, expressed herself as being charmed with the tour of the world. eyes, stated, "To me there is no place on earth like the Hawaiian Kingdom, where the enjoyment of lawn tennis and dancing is always obtainable." Honolulu, December 18, 1885, page 3. Last evening Miss Ellen Coney was married at her mother's residence, to Mr. John L. Graham, of New York, the Rev. J. A. Cruzan officiating and a pleasant company looking on. A reception and luau were afterward held at the house of Mr. John Enn. The couple will leave by the Mararoa on their journey to New York. Honolulu, January 18, 1886, page 3. From Maui and Hawaii, per steamer Kinau, Sunday, January 17. Honolulu, February 16, 1886, page 3. The Mariposa carried away a number of Kamamas. Among then are ... Mr and Mrs Graham (nee Ellen Coney) ... Bon voyage and safe return. Honolulu, January 24, 1888, page 3. Mr. John L. Graham, well known in this city, as having married a daughter of Mrs. Coney, has been admitted as a partner in the house of E. Gogorza & Co., Commission Merchants of New York City. This firm is widely and honorably known, having been for the last 25 years connected with the South American trade. Despite intense research, Skipper was unable to locate any supporting evidence in the microfilm reel archives of Asbury Park's The Daily Press, from 1886 to 1889 or those of The Daily Spray (1886-1889). Microfilm reels of The Shore Press (the Sunday edition of The Daily Press) are available for 1886, 1887, and 1889, but, unfortunately, there are no editions from 1888. Skipper suggests that there may be a paper collection at New Jersey Department of Records Management.